Directions Use as recommended by physician. Flush syringe thoroughly with warm water before each use. Use only warm tap water or physician recommended solution at about body temperature. Patient should be seated holding basin under ear to catch returning solution. Holding ear lobe gently between thumb and forefinger, pull back and upward slightly to maximize exposure of ear canal. 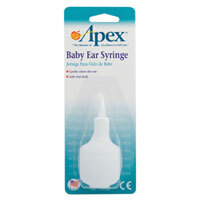 Direct ear syringe tip toward the inside of the ear canal, not directly back toward the eardrum. Gently squeeze bulb to allow the solution to flow into ear canal. When ear canal is fully irrigated, hold bulb loosely so the tip does not interfere with water leaving the ear canal. NOTE: Never forcefully inject liquid into the ear canal. Manufactured without carcinogens. Cleaning and Storage: Clean syringe thoroughly in warm soapy water. Rinse syringe several times, squeeze out excess water, and air dry. Store in cool dry place. Uses Infant/adult. 1 ounce capacity. Latex free. Unique design. 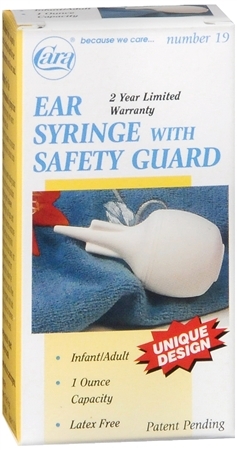 The Safeguard ridge is designed to assist in limiting the depth the ear syringe penetrates into the ear canal. Manufactured without carcinogens. Warnings If child experiences pain or dizziness, discontinue use. Do not resume irrigation without consulting a physician. Never irrigate patient's ears if any drainage or bleeding is noted. Use of anything other than plain water, or doctor recommended solution, may damage product or injure the child. Do not place heavy or sharp objects on top of product. Do not expose product to direct sunlight or heat, as it will adversely affect the product.